Julian Clary has brought joy to audiences as a comedian and entertainer and his debut children’s novel The Bolds – which is illustrated in style by David Roberts – will only increase the sum of happiness in the world. The story starts in Africa where a pair of jolly hyenas Sue and Spot come across the remains of a honeymoon couple who foolishly chose to go for a dip in a pond with a resident crocodile. All that’s left of the tourists is clothes, passports, plane tickets home, and the keys to their house. Sue has always dreamed of living in England, the opportunity is too good to miss! Soon the two hyenas are settled in Teddington as Fred and Amelia Bold, concealing their animal appearance by walking upright, their tails hidden in natty human clothes. All goes well and their house is full of hyena laughter, they find jobs – Amelia sells hats, Fred writes the jokes for a Christmas cracker company – and become parents of twins, Betty and Bobby. There’s a dodgy moment when their reclusive, decidedly unfriendly neighbour Mr McNumpty spots Fred marking his territory in the garden with his bare bottom, and the incident makes Fred realise how much he’s missing his old home. A trip back to Africa is out of the question, so instead they decide to visit the local safari park. Everything makes this family happy, they have a whale of a time and are very excited to meet the park’s hyenas. One of these, Tony, is old and frail and the other hyenas overheard the vet saying it’s time he was put to sleep. The Bolds are determined to help and launch a daring rescue plan. They start digging a tunnel by night – in this section text and illustrations are white against inky black pages, which looks wonderful and adds to the tension of the scenes – it’s difficult and dangerous, and nearly ends in disaster but they get Tony out. Back home Mr McNumpty is still spying on his unusual neighbours, but everything changes when Tony chases off a gang of local youths who are tormenting the old man and from then on McNumpty is a real friend. Over Christmas lunch he lets slip that he always knew his neighbours were animals, and reveals a secret of his own too. The story finishes with everyone sharing jokes, and laughing. The jokes are many, and very good indeed, but this is much more than just a series of funny incidents linked together: there’s a proper story, with action and excitement. 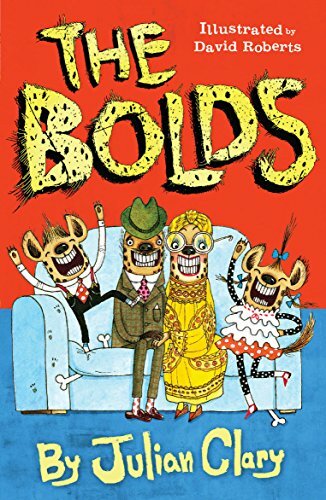 Inventive and lively, The Bolds also does a great deal, in a gentle, understated way, to promote the benefits of kindness and tolerance, as well as the importance of being true to yourself. David Roberts’ illustrations are an absolute joy too.